This group focuses on the applications of enzymes, enzyme inhibitors, nanomaterials and biosensors in the food, health, biotech and environmental areas. The focus and problems being addressed are described below. Pectinase has been used for the fruit juice clearance and oil extraction. Partially saturated canthaxanthin has been used as food colour and it was reported to show anticancer and antioxidant activities. When both the metabolites treated with carbon nanotubes (CNTs), they have been showing significantly high activities. Methotrexate degrading enzymes are required to overcome the toxicity of the methotrexate while treating the cancer. The enzyme from Variovorax paradoxus converts the methotrexate in to non-toxic products. Methotrexate degrading enzyme from V. paradoxus is a dimeric protein with a molecular mass of 46 KDa. 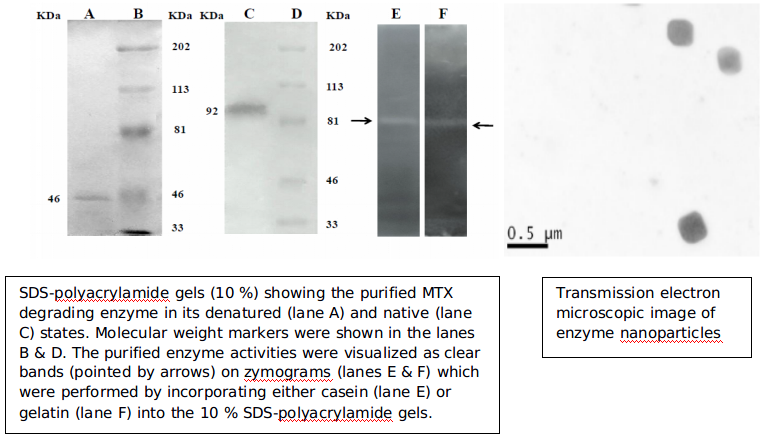 Enzyme nanoparticles can degrade methotrexate faster than the native enzyme and they show lower Km compare to the native enzyme. Enzyme nanoparticles show better thermal stability and they are found to be stable for much longer time in the serum compare to the native enzyme. Enzyme nanoparticles show better functionality than the native enzyme while clearing the methotrexate added to the serum suggesting their advantage over the native enzyme for the therapeutic and biotechnological applications. Identification and isolation of Lipase inhibitors from Streptomyces Spp. Orlistat is the only commercially available lipase inhibitor for the treatment of obesity. But it has side effects like gastric problems, acute kidney injury and acuteoxalate nephropathy. Hence, there is a need to explore for new inhibitors. 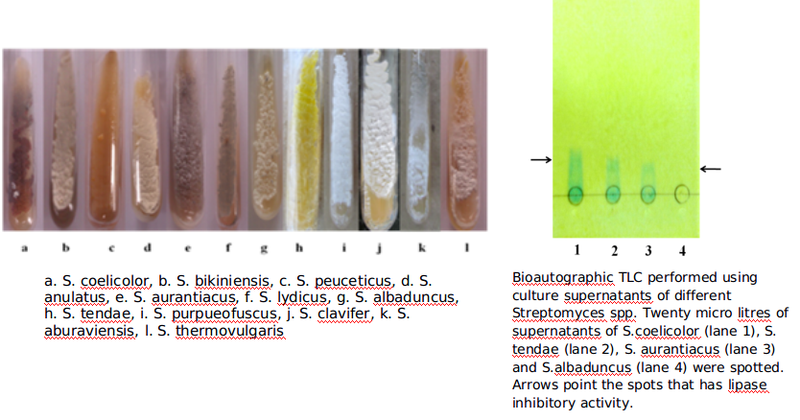 Streptomyces spp (Fig.4) are being explored for inhibitors and new autobiographic method has been developed (Fig.5) for detecting lipase inhibitors. One of the major contributors for water pollution is textile dyes and some of them are carcinogenic. It has been found that bilirubin oxidase enzyme from the fungus Myrothecium verrucaria can degrade the textile dye, reactive blue 25 significantly suggesting the usage of this enzyme for the polluted water remediation. Ammonia is one of the toxic contaminant of air, water and food. It is injurious to the health and its monitoring is important to avoid tragedies. An ammonia biosensor based on the enzyme alanine dehydrogenase is developed, which is highly specific and responds to broad range of ammonium concentrations. 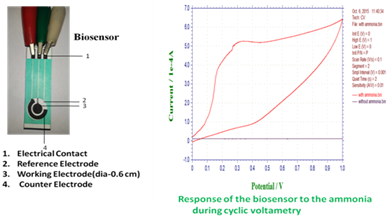 Multiwalled carbonnanotubes are found to enhance the response and sensitivity of the ammonia biosensor. Purification and characterization of Alanine dehydrogenase from Streptomyces anulatusfor its application as a bioreceptor in biosensor. Dave UC, Kadeppagari (2017) FEMS Microbiology Letters In press IF: 1.76. Improvement of bilirubin oxidase productivity of Myrothecium verrucariaand studies on the enzyme overproduced by the mutant strain in the solid-state fermentation. Bayineni VK, Suresh S, Sharma A, Kadeppagari (2017) The Journal of General and Applied Microbiology. In press IF: 0.9. Characterization and kinetics of the lipase inhibitory activity of Streptomyces tendae. Singh G, Bayineni VK, Kadeppagari, RK. (2017) International Journal of Pharmacy and Bio Sciences 8(2): (B) 270-274. Freeze dryer, -80 and -200C Freezers, Tip Sonicator, Electrophoresis unit, Rotary evaporator, Cooling centrifuge, BOD incubator, Laminar Air Flow etc. 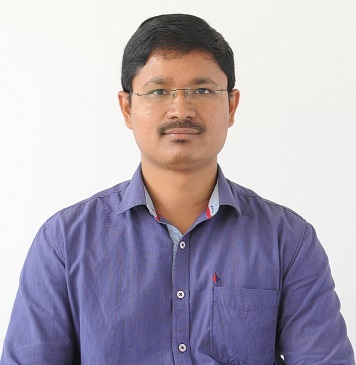 Venkata Krishna B obtained his master degree in microbiology from Bangalore University and currently registered for Ph.D. in biotechnology under VTU. 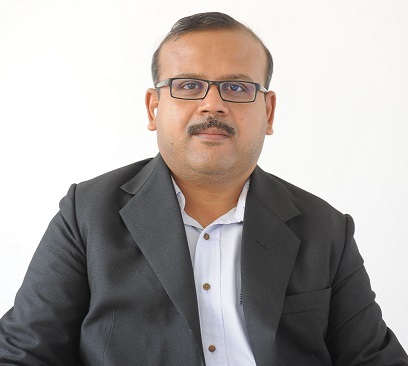 He worked as a microbiologist at Institute for Analysis of Dairy, Food and Cultures (IADFAC), Bangalore which is a NABL accredited commercial food testing laboratory. He also worked as research fellow in the SERB funded project and published several papers in peer reviewed international journals. He has qualified National Eligibility Test (NET) conducted by the Agricultural Scientists Recruitment Board (Dept. of Agricultural Research and Education, Govt. of India). He is a life member of the Society of Biological Chemists (SBC, India). He has two years of industrial experience and four years of research experience and participated in several national and international conferences and workshops. He is currently working as a Research Fellow on nano CLEAs for therapeutic applications, integrated biotechnology and radiation methods for the remediation of hazardous dyes and production and applications of novel metabolites from microbial sources.